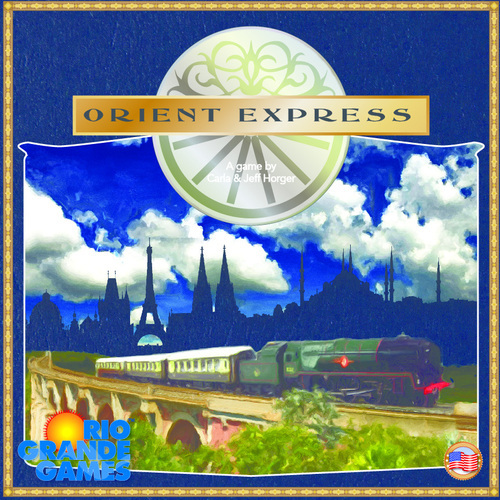 Orient Express is a new 2017 release from Rio Grande Games, and it is a sequel to 20th Century Limited, a 2015 release by the same duo. In this new version of the game, players control competing railway companies – each trying to contribute the most to the Orient Express. 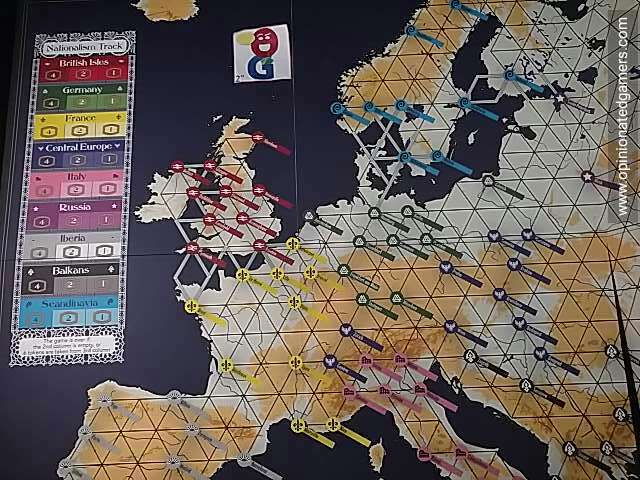 The board is a hex-map of Europe, with many labeled cities scattered around the map (more or less in their real locations). A nationalism track is found out in the Atlantic Ocean off to the left of the British Isles. Next to the board are four Passenger cards (with a draw deck next to them). These passenger cards have 4 cities on them and a point value for the card beneath the cities. Additionally, at the top, there is a small crescent area which has one of nine different Bonus Scoring designs. On the other side of the board, the nine decks of regional cards are found. 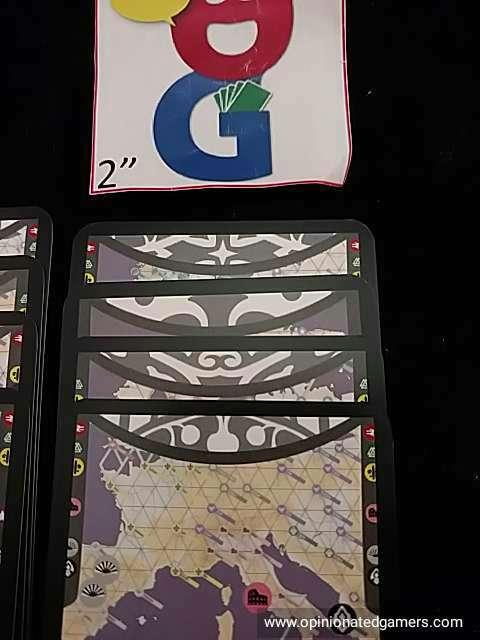 To start the game, each player then gets 5 cards which can be chosen from the passenger cards, passenger deck or from any of the 9 regional decks. (The rules also give you a starter setup of cards which appear to give a balanced start.) Players also get a player aid sheet, 35 track pieces, and 10 Entry Waivers (which are white cubes). Finally, three bonus cards – one from each of three decks – is randomly selected and placed next to the board as well. On a turn, a player has a number of things that he must do, and a number of optional actions as well. The thing that must be done is placing or removing track. If you place track, you take 1-3 track pieces from your supply and place them on any unoccupied connection lines on the board. They do not have to be adjacent to your own or any other previously played track. They just have to sit on a previously un-occupied line on the board. You could choose to play on a Ferry Crossing (these are thick light blue lines), but you will need to discard one Entry Waiver (white cube) from the game for each Ferry segment placed. If you choose to remove track, you must take 1-3 track pieces off the board and return them to your supply. Those options comprise the mandatory part of your turn. You also have the choice of doing one of three optional actions – but only one can be done in a turn. You can choose to score a passenger card, choose to score a regional card, discard a card from your hand (either passenger or region) and draw a new card from any deck or the Passenger tableau. For all of the decks of cards, once they are exhausted, there is no re-shuffling. That deck is simply exhausted for the remainder of the game. You can score a passenger card if all of the cities listed on that card are connected by one contiguous group of your track segments (unless you use Entry Waivers). When you score the card, take it from your hand and place it face down on the scoring area of your Player Aid. All of the track remains on the board. You can choose to draw a card from any deck or the Passenger tableau. You can score a Regional card if all of the cities listed on that card are connected by one contiguous group of your track segments (unless you use Entry Waivers). When you score the card, take it from your hand and place it face down on the scoring area of your Player Aid. Also, look at the Nationalism track on the board, and take the highest remaining token from the matching area. 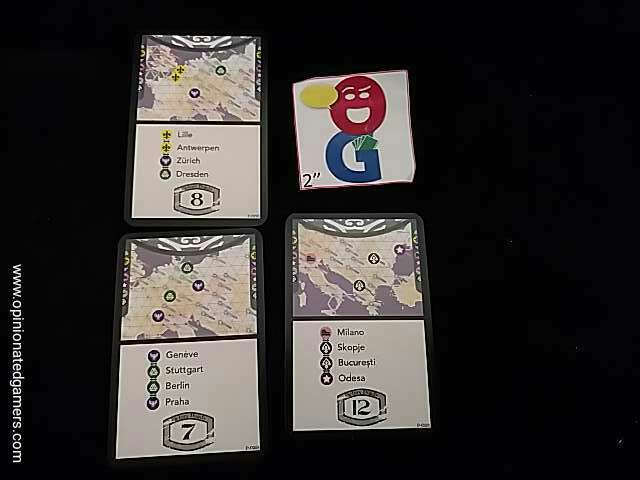 Draw a new card, and then remove the minimum number of track segments from the board which fully connect the cities listed on your card. You can use your Entry Waiver cubes to use opponent track segments as your own when completing a Regional or Bonus card. You pay one token per opponent segment used, and you are limited to using no more than 5 segments from any particular opponent in a turn. You also must have at least one track segment of your own used in the connection. When you complete a Regional card with Entry Waivers, you only remove track segments that you own; you never remove opponent’s track pieces. These Entry Waivers spent in this manner are placed in the supply of the other player – they can be spent again later. Finally, at any point during your turn, you may collect a bonus card if you are the first player to meet the requirements of that card. Take the bonus card and place it on your scoring stack. You also have the opportunity ONCE on a turn to discard an Entry Waiver cube to discard all of the Passenger cards from the tableau and deal four new cards face up. Note that if a card is not taken from the new tableau in that turn, that player must then discard an additional Entry Waiver cube. 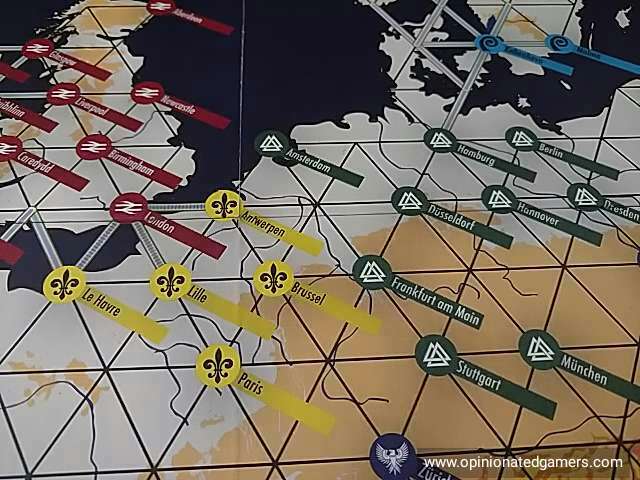 The game continues on until one of two states in met on the Nationalism track – either all the tokens in the center column are taken OR six regions have ALL their tokens removed. At this point, play continues around the board until all players have had an equal number of turns. Then, each player counts up their score. The completed passenger cards, completed regional cards and collected bonus cards on the player aid are worth the number printed on the card. Each Nationalism token collected has a value on it. Each remaining Entry waiver cube is worth 1 point. If there are any Bonus cards that score at the end of the game, check to see if you qualify for the bonus. Finally, look at the bonus designs on your passenger cards; for each of the nine different designs, you score the square of the number of cards that you have of each. Orient Express is an interesting route building game – In this new version, you now lay track all over Europe (as opposed to North America in 20th Century Limited). 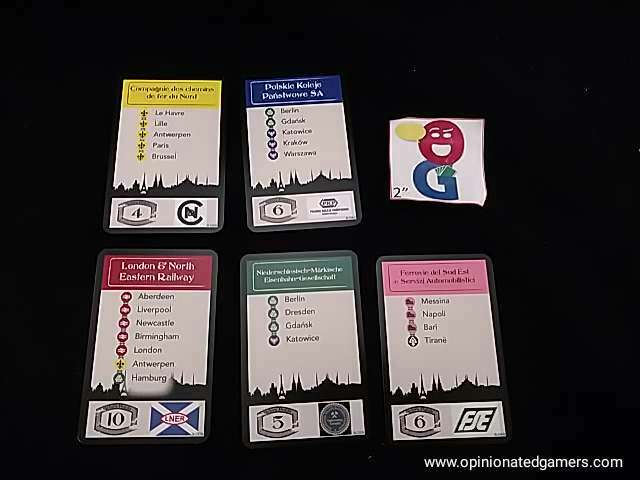 Many of the basic concepts of the old game remain, but there are a number of rules additions that make Orient Express slightly more complex (Nationalism tokens, ferries, and the Bonus for collecting Passenger cards). Your options on each turn are fairly simple – in general you are either building up your network or perhaps collecting track from the board in order to put it somewhere else. As you build your network, you are trying to achieve your own goals (passenger/Regional cards), but you should also be keeping an eye out on what your opponents are doing. I personally try to connect up as much as I can – even if I don’t have a card currently for a particular city. On one hand, I might end up drawing a card later in the game and it’s helpful to already be connected to a city on that card. On the other hand, if I’m connected to a bunch of cities – that might lead someone to use my track segments and pay me Entry Waiver cubes – which I can then use myself on a later turn. There is an interesting dichotomy between the two types of cards. 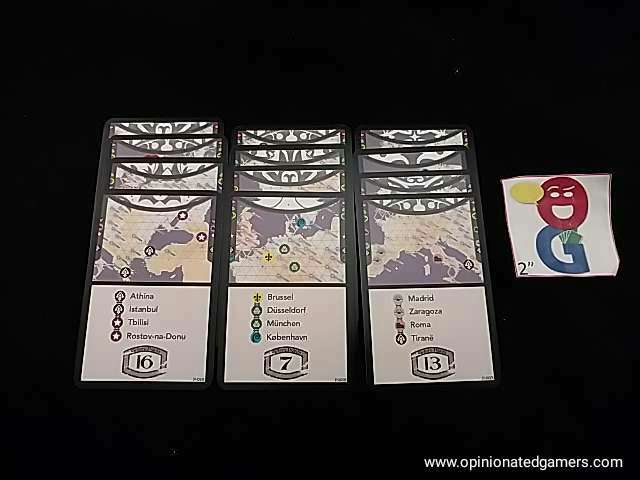 The Regional cards score well – both on the card as well as the additional bonus received on the Nationalism token, and they are often easier to complete because (as their name suggests) the cities are all in the same region of the board. However, this comes at a cost – you will have to remove the track segments from the board when you score it – so you will not be able to use those track segments again. The Passenger cards have a much higher payoff; but the routes might stretch to all four corners of the board – so they are much harder to complete. Trying to figure out how you’re going to complete your cards is a big challenge in the game. It does seem like the Passenger routes in the game are spread out across the entire map so that you can’t just occupy a main central corridor and score lots of points for repeated Passenger cards. The complexity level of the game is good for me – it’s a bit more than Ticket to Ride or Transamerica, but still something that can be easily explained and played in a short-ish period of time. It does, perhaps, lack the simple elegance of the previously named train themed games, but sometimes I’m looking for something with a bit more to the decision making process, and this would fit that niche nicely before I’m forced to move into Power Grid, 18xx or Age of Steam territory. The route building (to complete the cards) is a nice puzzle, but Orient Express feels less complicated because you’re not worrying about money or stocks or anything else. You just concentrate on the routes in this one. The original game was somewhat panned for its poor ergonomics, and while some of those things were fixed in the new version, there is still a lot that I wish were presented better in Orient Express. The city text is still somewhat obscured by all the track pieces on the board, though I’m happy to say that at least the track bits fit on the space provided by the hex grid on the board. The board can get cluttered with all sort of track bits lying around – and since they don’t have to be connected to other track of the same color, there’s no guide to putting them back in the right places if they are disturbed – but you will constantly have to move the track around in order to read the city names. here are twelve cards… how many different types do i have? And, while I’m on the art/graphic design, I’ll at least throw it out there that I think the cover art is awful. Yes, I know that this is just a matter of taste, so there’s no right or wrong – but it looks like an Instagram picture where someone overlaid a blurry filter on top of it to obscure any detail. Also, while the game title/logo is nice – there is a curious decision to make this element the smallest thing on the side of the box. 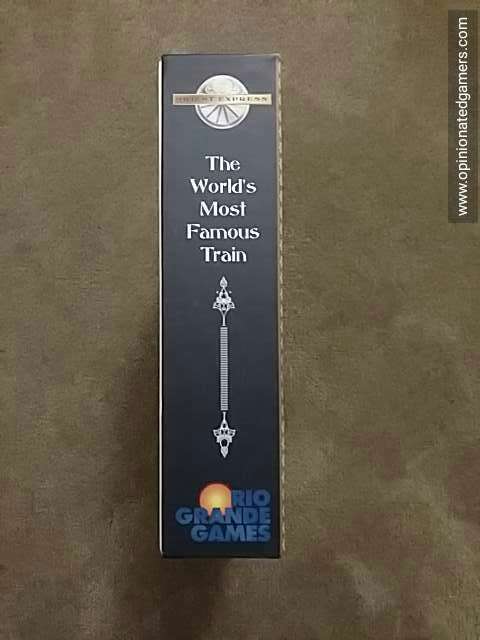 If I stand the box on its side, you might think that the name of the game is “The World’s Most Famous Train”. Sure, this doesn’t affect gameplay at all, but it’s just rare to see a game from a major publisher have such poor graphic design. Overall, this is a solid train/network game, though there are still some ergonomic issues which keep the game from being as good as it could be, and those issues are probably enough to keep the game from becoming a regular in the collection. For rating purposes, it would be “I like it” for gameplay, but overall will be rated a “Neutral” for the playability issues. This game also essentially fires 20th Century Limited as I feel the gameplay is much better than the original. A demo of “20th Century Express” at WBC left me flat – interesting, but not exciting. It sounds as though I wouldn’t like “Orient Express” much better despite the new decision-making elements. I think you’re being much too kind in regards to the art and graphic design. This is one of the ugliest games I’ve seen in a very long time. That art was top notch in the 60s.